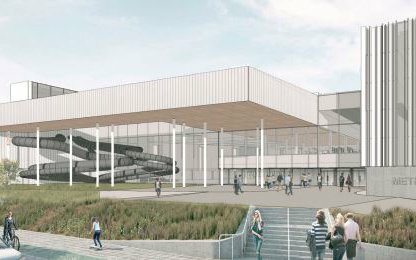 Preliminary design images of the Metro Sports facility have been released by Ōtākaro Limited and the Christchurch City Council. The facility which will be the largest aquatic and indoor recreation and leisure venue of its kind in New Zealand. At around 34,000m2, with a 50 metre, 10-lane competition swimming pool and a separate diving pool, large aquatic leisure area, five hydroslides, fitness spaces and nine indoor courts for sports such as netball and basketball, it will be a place for fun and recreation. It will also cater for the day-to-day needs of the educational and high-performance sporting communities in the region. “The Metro Sports Facility will be a notable statement in the central city, providing a much-needed centre for aquatic and indoor sport activities in both competitive and leisure settings. Having a world-class facility, meeting and exceeding international standards, will bring competition aquatic sport right into the heart of Christchurch, while the provisions for leisure and community spaces create room for the whole community to participate,'' said Greater Christchurch Regeneration Minister Gerry Brownlee. Ōtākaro Chief Executive Albert Brantley said the Metro Sports facility would be a world-class facility, accessible to people of all ages and abilities. “These images show the look, size and complexity of this Anchor Project, although there will be further refinements. The high level of consultation with future users and the extensive planning that has gone into the Metro Sports Facility will ultimately ensure it is the best facility possible for Christchurch,” Mr Brantley said. Mayor Lianne Dalziel said the Crown and the Council were working in close partnership to create a facility the whole region could be proud of. "With an average of 40,000 people expected through the doors each week I'm confident it will reignite sport and recreation participation rates, and be another good reason to live in and visit the central city,” the Mayor said. Construction of the Metro Sports facility will be managed by Ōtākaro Limited. It will be jointly funded by the Crown and the Council, with the Council being the operator of the facility after completion early in 2020. Early works on the site and neighbouring Stewart St and Balfour Tce will get underway next month and motorists are advised the temporary Wilsons carpark currently on the site will be closed. Main construction work will begin around June 2017. The Metro Sports Facility will be capable of hosting national and international events with 1000 poolside seats and 2500 grandstand seats flanking the show court. Sport Canterbury and High Performance Sport New Zealand will both be based in the facility. Sport Canterbury Chief Executive Julyan Falloon said the new facility would be a great community asset for Christchurch people. “With so many disciplines catered for under one roof, Metro Sports will also be a centre of excellence for our promising and talented athletes, who will be motivated by the success of those around them. The facility’s ability to host major sport and recreation events, attracting residents and visitors alike will also be a major draw card,'' Mr Falloon said.